What are the benefits of American Kenpo? People from all walks of life study American Kenpo. It can benefit you physically and mentally by improving your levels of fitness, coordination, self confidence, and self esteem. The adult program at Brian Duffy¹s Kenpo Karate is unsurpassed. Men who compete in today¹s society will gain increased confidence to cope with any situation. Release of stress and tension are also gained from consistent study of the art. With all the benefits of increased self confidence and improved fitness combined with reduced stress and tension you will notice an increase in your stamina and enthusiasm for everyday life. These benefits will also be noticed and appreciated by your family, friends, co-workers and employers. Brian Duffy¹s Kenpo Karate makes a difference. Mr. Duffy and his staff teach a solid philosophy of self control, self respect, and goal setting. In turn the students feel success and achieve recognition as their skills develop and they progress. Many parents worry about their children being safe on the street. The well being of a child can be threatened by adults as well as other children. Brian Duffy¹s Kenpo Karate teaches children to think instead of panic in a threatening or potentially dangerous situation. Effective self defense techniques together with our "Stranger Awareness Training" give your child the tools of personal safety. Every child wins. Each child progresses individually and every child is involved. There is no "bench warming " at Brian Duffy¹s Kenpo Karate. Our program allows children to reach their own potential at their own speed. Our goal is to create a positive experience for each child. At Brian Duffy¹s Kenpo Karate every child is a winner. Kenpo is great for conditioning. Kenpo challenges the entire body. It helps develop balance, agility, poise, and dexterity often neglected in team sports. Lessons st our studio are dynamic and challenging for children who are athletic, energetic, awkward, shy, bold, nice or maybe a little wild every once in a while.... Brian Duffy¹s Kenpo Karate is probably just right for a child like yours. We offer programs for children age five and above. Kenpo is an activity for all ages. Preschoolers, boys, girls, men, and women; people who want to exercise and learn self defense at the same time, people who are looking for different levels of athletic competition, higher levels of self confidence, and improved coordination; these are the types of people who study American Kenpo. 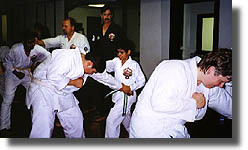 At Brian Duffy¹s Kenpo Karate every member of your family can benefit from learning Kenpo. It is an activity ideally suited for family participation whether you are husband and wife, parent and child, or brother and sister. We offer special discounts to encourage families to take part in Kenpo together as an added convenience and support.